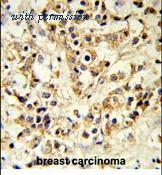 Immunohistochemical analysis in formalin fixed and paraffin embedded human breast carcinoma followed by peroxidase conjugation of the secondary antibody and DAB staining. 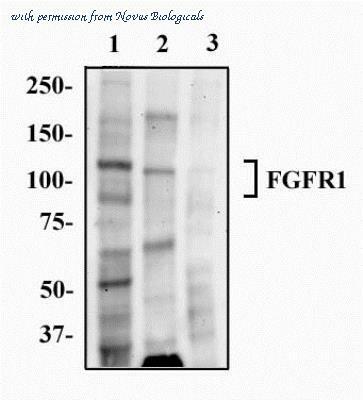 Western blot analysis of FGFR1 in mouse liver tissue lysates using 35ug per lane of antibody. 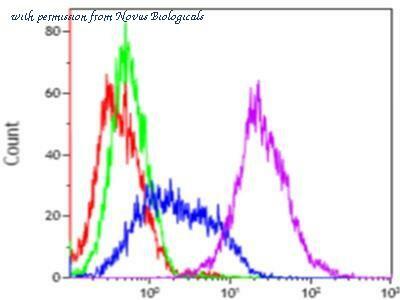 Flow cytometric analysis of MCF-7 cells (bottom histogram) compared to a negative control cell (top histogram). FITC-conjugated goat-anti-rabbit secondary antibodies were used for the analysis. 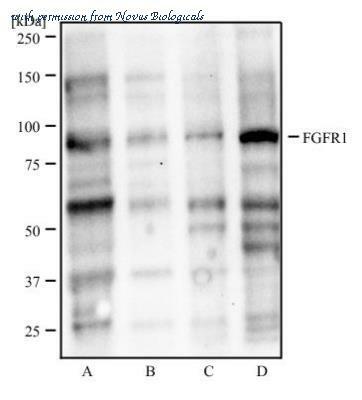 Detection of Human Phospho- FGF R1-4 (Y653/Y654) by Western Blot. Western blot shows lysates of KATO-III human gastric carcinoma cell line untreated (-) or treated (+) with 100 ng/mL Recom-binant Human FGF acidic (Catalog # 232-FA ) for 15 minutes. 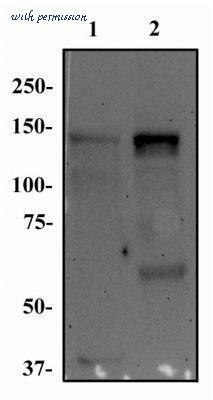 PVDF membrane was probed with 0.5 ╡g/mL of Rabbit Anti-Human Phospho-FGF R1-4 (Y653/Y654) Antigen Affinity-purified Polyclonal Antibody (Catalog # AF3285), followed by HRP-conjugated Anti-Rabbit IgG Secondary Antibody (Catalog # HAF008 ). 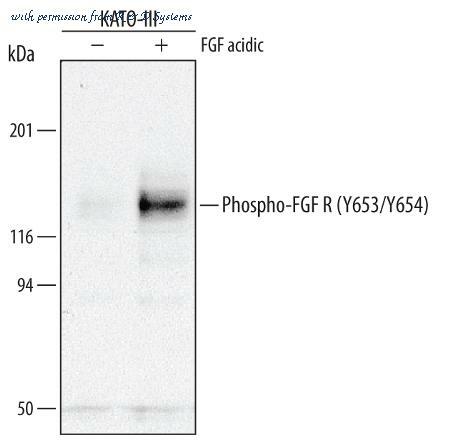 A specific band was detected for Phospho-FGF R1-4 (Y653/Y654) at approximately 120 to 145 kDa (as indicated). This experiment was conducted under reducing conditions and using Immunoblot Buffer Group 1 . 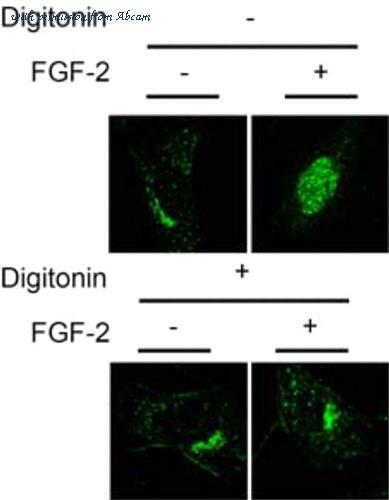 FGF R1 alpha Inhibition of FGF acidic-dependent Cell Proliferation and Neutralization by Human FGF R1 Antibody. 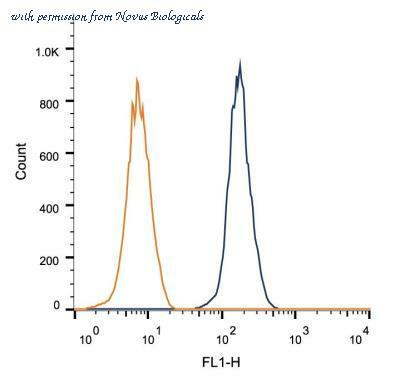 Recombinant Human FGF R1 alpha (IIIb) Fc Chimera (Catalog # 655-FR ) inhibits Recombinant Human FGF acidic (Catalog # 232-FA ) induced proliferation in the NR6R-3T3 mouse fibroblast cell line in a dose-dependent manner (orange line). 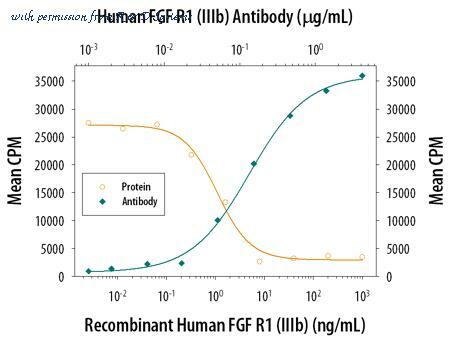 Inhibition of Recombinant Human FGF acidic (0.3 ng/mL) activity elicited by Recombinant Human FGF R1 alpha (IIIb) Fc Chimera (6 ng/mL) is neutralized (green line) by increasing concentrations of Human FGF R1 (IIIb) Monoclonal Antibody (Catalog # MAB765). The ND50 is typically 0.075-0.3 ╡g/mL in the presence of heparin (10 ╡g/mL). 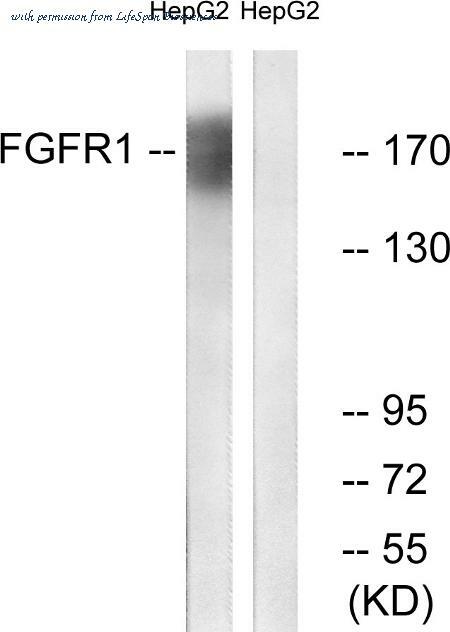 The FGFR1 antibody from Proteintech is a mouse monoclonal antibody to a recombinant protein of human FGFR1. This antibody recognizes human, mouse antigen. 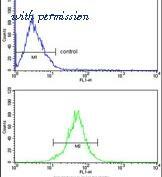 The FGFR1 antibody has been validated for the following applications: ELISA, WB, FC, IHC analysis. Anti-FGFR1 antibody IHC of human pancreas. Immunohistochemistry of formalin-fixed, paraffin-embedded tissue after heat-induced antigen retrieval. Antibody dilution 1:50. 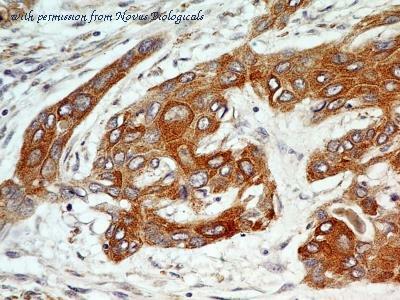 Immunohistochemistry analysis of paraffin-embedded human breast carcinoma tissue, using FGFR1 Antibody. The picture on the right is blocked with the synthesized peptide. Western blot analysis of lysates from HepG2 cells, using FGFR1 Antibody. The lane on the right is blocked with the synthesized peptide. Flow Cytometry: FGF R1 Antibody (M19B2) [NB600-1287] - Intracellular flow cytometric staining of 1 x 10^6 HEK-293 cells using FGF R1 antibody (dark blue). Isotype control shown in orange. An antibody concentration of 1 ug/1x10^6 cells was used. 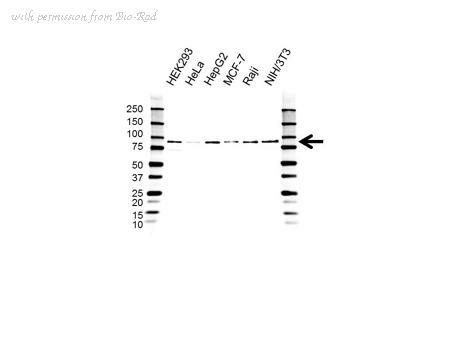 Western Blot: FGF R1 Antibody (M19B2) [NB600-1287] - Western blot analysis of MCF7 (A), HepG2 (B), NIH3T3 (C), and PC-12 (D) cell lysate using FGF R1 antibody at 2 ug/ml. 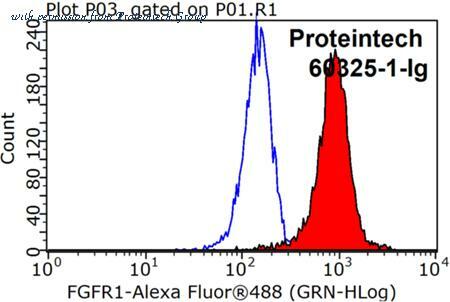 Flow Cytometry: FGF R1 Antibody (M19B2) [NB600-1287] - Analysis using the Alexa Fluor (R) 488 conjugate of NB600-1287. 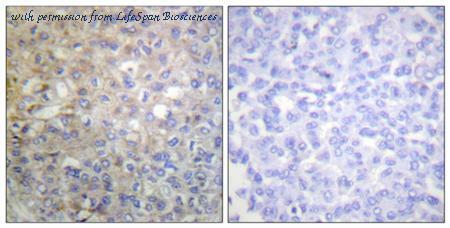 Staining of FGF R1 in HEK293 and HEK293 FGFR transfected cells using anti-FGF R1 antibody. Red - positive cells, Green - negative cells, Blue - negative cells + antibody, Pink - positive cells + antibody. Image from verified customer review. Immunohistochemistry-Paraffin: FGF R1 Antibody (M17A3) [NB100-2079] - IHC analysis of formalin-fixed paraffin-embedded tissue section of human normal skin using mouse monoclonal FGF R1 Antibody (clone M17A3) at 5 ug/ml concentration. The keratinocytes of the epidermal layer showed a very strong membrane-cytoplasmic with relatively weak nuclear staining for FGF R1 Antibody. The stratum basale layer of keratinocytes depicted more of membrane-cytoplasmic staining for this protein. Flow Cytometry: FGF R1 Antibody (M17A3) [NB100-2079] - Analysis of FGF R1 in MCF-7 cells (1x10^6 cells/ml) were stained with FGF R1 antibody (NB100-2079, red) at 1:1000 dilution. Detected with FITC conjugated goat anti-mouse IgG1 isotype control (green). Two distinct samples shown. Western Blot: FGF R1 Antibody (M17A3) [NB100-2079] - Whole cell protein from HepG2 (lane 1), 3T3 (lane 2) and PC12 (lane 3) was separated on a 7.5% gel by SDS-PAGE, transferred to PVDF membrane and blocked in 5% non-fat milk in TBST. The membrane was probed with 4.0 ug/ml anti-FGFR1 in 1% milk and detected with an anti-mouse HRP secondary antibody using chemiluminescence. 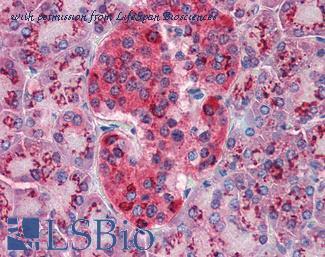 Immunohistochemistry-Paraffin: FGF R1 Antibody (M17D10) [NB100-2080] - IHC analysis of formalin-fixed paraffin-embedded tissue section of human liver using mouse monoclonal FGF R1 antibody (clone M17D10) at 5 ug/ml concentration. The hepatocytes depicted an expected and specific membrane-cytoplasmic-nuclear immunostaining of FGF R1 protein. Flow Cytometry: FGF R1 Antibody (M17D10) [NB100-2080] - Analysis of FGF R1 in MCF-7 cells (1x10^6 cells/ml) were stained with FGF R1 antibody (NB100-2080, red) at 1:1000 dilution. Detected with FITC conjugated goat anti-mouse IgG1 isotype control (green). Two distinct samples shown. Immunohistochemistry-Paraffin: FGF R1 Antibody (M17D10) [NB100-2080] - IHC analysis of formalin-fixed paraffin-embedded tissue section of human esophageal squamous cell carcinoma (SCC) using mouse monoclonal FGF R1 antibody (clone M17D10) at 5 ug/ml concentration. Specific membrane-cytoplasmic immunopositivity of FGF R1 protein was observed in SCC cells whereas the nuclei of SCC cells as well as the tumor stroma was largely negative for this protein.